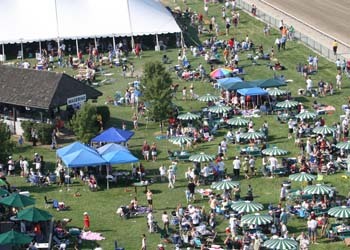 The Picnic Grove offers guests of Parx Racing Racetrack the enjoyment of watching excellent thoroughbred racing in a relaxing, park like atmosphere. The picnic grove features three shaded pavilions, a wagering pavilion, gazebo bar, outdoor bathrooms, over 100 tables with umbrellas and a playground for the kids. Charcoal grills with self-starting briquettes are welcome. (no propane, no lighter fluids). NO outside alcoholic beverages are permitted on the grounds; coolers are checked.